Gen 2 GPS Collars | Telonics Inc. In 1996, Telonics published a special issue of the Telonics Quarterly on GPS Applications for Wildlife Studies. (Click here for PDF format, TQ Vol. 9, Number 1, Spring and Summer 1996.) While the information included in the special issue is now several years old, much of the theory and many of the technical concepts remain current. The articles will provide you with considerable background information on GPS technology. However, the references to specific product configurations and operational life calculations are based on Telonics Generation 1 units. These configurations are now outdated. Over the past year, our engineers have developed the Generation 2 GPS Collars while continuing to deploy Generation 1 systems in the field. The Generation 2 systems are now ready for deployment. Please consult our factory for delivery schedules. Much has been learned about collecting and processing GPS data from remote sites and animal born packages. As with most engineering efforts, actual field trials and deployments provide more information than any other source. For example, our techniques for dealing with power management have been refined -- the new Generation 2 units consume less power and thus operate over a longer operational life than Generation 1 units. Generation 2 units also incorporate a lower power GPS receiver that is capable of a more rapid time to first fix (TTFF). This advancement further extends the field life of the Generation 2 units. A user interface serial port permits the researcher to reprogram the user changeable parameters in the Generation 2 unit. This capability allows researchers to alter duty cycles and GPS fix time schedules as well as other parameters. Fig 2. The single pin serial port allows the researcher to change selected parameters such as GPS fix time intervals. The serial port is also used to download GPS data from memory. 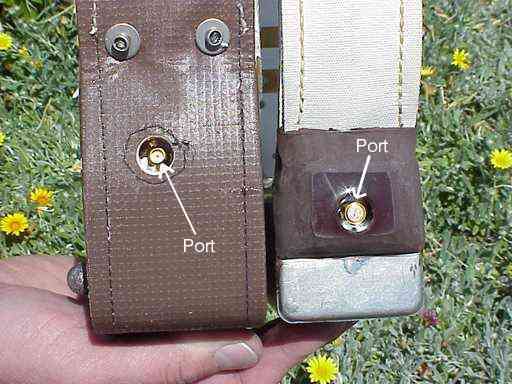 The port is shown open on the left and with its protective cover on the right. The memory available on board the unit has been greatly expanded to allow for the storage of additional positions. A total of 2800 positions (with all the elements for differential correction) can be stored in the memory as compared to the 750 positions in the Generation 1 units. An extended memory option can be specifiedat time of order, increasing the memory available to handle up to 5300 differentially correctable positions. The new GPS receiving antennas are smaller, consume less power and are packaged in more durable housings than earlier GPS antennas designed for Generation 1 systems. Perhaps the most important and long awaited capability incorporated in the new systems is the Post Processed Differential Correction (DGPS) capability. The first system stores all the GPS positions in a nonvolatile memory on board the deployed units (often called rovers). These systems are referred to as GPS/Store-on-Board Systems (GPS/SOB). The units, or rovers, must be physically recovered to download the data. The GPS data are ported from the unit to a computer. Telonics can download the data at our laboratory. You can purchase a utility program and cable (model numbers DU-1 Download Utility or DCU-1 Differential Correction Utility and TSC-1 Telonics Smart Cable) to download the data yourself. If differential correction of the GPS data are required, then the data from the rover must be processed in association with appropriate base station files to provide the differentially corrected positions. The user must assure that theappropriate base station files from the region of the deployment are available and retained. Depending on where the GPS units are deployed, files may be available from existing base stations already in operation in the region. The files can be accessed on the Internet or from the local base station operating a direct dissemination system in the form of a Bulletin Board system (BBS). In some cases, particularly in remote locations where base stations are not already located in relatively close proximity to your study animals (within 300 Km), it may be necessary to install and operate your own base station to obtain the files for use in the differential correction. We can help you identify your requirements and make recommendations on how to acquire these files. If differential corrections are to be made, DCU-1 (Differential Correction Utility) and TSC-1 (Telonics Smart Cable) are used to download files from the GPS unit (rover) and to modify the files into a format compatible with the program that actually does the differential correction. The differential correction software is a special version of Trimble Pathfinder Office. To utilize the DCU-1 software, the user must have a copy of Pathfinder Office and the associated software key. The DCU-1 software will not operate without the Trimble Pathfinder Office software key. If differential corrections are not required and standard accuracy [under Selective Availability (SA)] of 100m is adequate, base station files are not required. The data are complete and ready to go into your database immediately after downloading. Two activity sensing options are available in this generation of GPS SOB systems. Each option measures activity in a different way and one or the other may be more appropriate to a particular research question. Option TACT-2 measures the state or position of a motion sensitive switch installed inside the GPS unit. The user is able to specify the data collection interval. The data collection interval is initiated at the same time as the initiation of each GPS Fix attempt. This option reports the percentage of time the switch is closed position. For example, if the closed switch position of the switch corresponds to a particular position of the body i.e., head up, the information actually reported represents the percentage of time the animal's head was in the "up" position during the data collection interval. The resolution is 0.5% the data collection interval. Exact rules and limitations for setting the data collection interval are described in the Telonics Gen-II GPS System User's Manual. Option TEMP-1 measures the temperature inside the unit over the temperature range of -55 to +125 C. The resolution is 1 C.
The second GPS system available retains all the capabilities of the Store-on-Board system, but in addition provides a satellite data link to the researcher using the Argos Data Collection System. We call this system a GPS/Argos System. In this application the Argos system simply becomes a data transfer system and the Argos positioning is not an important element because the data returned includes a GPS position. Unfortunately, the Argos system has limited data throughput. The longest message that can be transferred is 32 bytes; therefore, it is not possible to transfer all the data required for a differential correction. Latitude and longitude (with commercial accuracy on the order of about 100m), along with time of the position fix, can be recovered using the Argos System. The exact transmitted record is in the TO2 format and is described in detail in a TQ Spring 1996 article. Although, the elements necessary for differential correction of the position cannot be transmitted through the satellite system, they are not necessarily lost. If the rover unit can be recovered, the data necessary for differential correction are in nonvolatile memory (SOB) and can be recovered. These data can be used in conjunction with appropriate base station files to establish differentially corrected positions. Temperature and activity sensor data are stored in memory but not transmitted through Argos at the present time. Canister Measurement: 2.64 X 2.76 X 4.18 inch. Option 002: The bracket is mounted to the 2.76 X 4.18 inch surface. Option 003: The bracket is attached to the 2.64 X 4.18 inch surface. Total Configuration Weight: To be determined. Weight < 2000 grams (includes weight of canister and collar). This collar configuration was initially designed for use on elk. If an external protective urethane cast is incorporated, the weight is < 2200 grams. Collar Configuration Options: GPS collars must be custom configured to the study species. The neck circumference adjustment range must be specified to +/- 2.0 inches to assure the optimum positioning of the GPS antenna on the dorsal side of the neck. The collar width is also an option that is tailored to the study animal and must be specified by the researcher. Example 1: A 2-inch wide butyl belting collar with an adjustment range of 16 to 19 inches weighs approximately 342 grams. Example 2: A 2-inch wide butyl belting collar with an adjustment range of 21 to 27 inches weighs approximately 445 grams. Protective Casting Options: For all GPS applications, it is advisable to cast either the antenna end of the transmitter housing (CAST-5) or the entire housing (CAST-4) in a high-density polymer that acts as a shock absorber. Based on the animal being instrumented, you may decide to include either of these two options. Please note that the casting will increase the weight of the configurations and add to the canister dimensions. The antenna end cast adds approximately 50 grams and the full cast can add anywhere from 100 to 150 grams depending on the configuration. Option 860-Standard memory: 2800 Differentially Correctable Positions. Option 861-Expanded memory: 5300 Differentially Correctable Positions. VHF Location Beacon. Options MDC Duty Cycles, MS6 Mortality and Option 400 GPS Last Fix Status are available. Transmitters can be programmed to cycle through up to eight periods in order to extend battery life. Within each period, the transmitter can either be "on" or "off". Pulse rates can be uniquely defined for each "on" period. Each period can be defined from eight seconds to approximately 50 days in length. The Argos message length is assumed to be 32 bytes. The Argos transmission interval is assumed to be 200 seconds. The time required for the GPS unit to fix position is assumed to be 90 seconds. Canister Measurement: 4.3 x 2.7 x 2.3 inch. Option 002: The bracket is mounted to the 2.7 X 4.3 inch surface. Option 003: The bracket is attached to the 2.3 X 4.3 inch surface. Total Configuration Weight: Approximately 1525 grams (includes weight of canister and CAST-5 option and collar). With external protective cast (designed for bears with CAST-4 option), the weight is approximately 1700 grams. Protective Casting Options: For all GPS applications, it is advisable to cast either the antenna end of the transmitter housing (CAST-5) or the entire housing (CAST-4) in a high-density polymer that acts as a shock absorber. Based on the animal being instrumented, you may decide to include either of these two options. Please note that the casting will increase the weight of the configurations and will add to the canister dimensions. The antenna end cast adds approximately 50 grams and the full cast can add anywhere from 100 to 150 grams depending on the configuration. Option 860: Standard memory: 2800 Differentially Correctable Positions. VHF Location Beacon. Option MDC Duty Cycles, MS6 Mortality and Option 400 GPS Last Fix Status are available. Transmitters can be programmed to cycle through up to eight periods in order to extend battery life. Within each period, the transmitter can either be "on" or "off". Pulse rates can be uniquely defined for each "on" period. Each period can be defined from eight seconds to approximately 50 days in length. Fig 3. Photo of TGW-300 GPS Store On Board System. The unit is with a CAST-4 option (fully cast). The unit also has a color coded collar. Canister Measurement: 4.3 x 2.7 x 2.3 inches (10.9 X 6.9 X 5.8 cm). Canister Weight: Approximately 860 grams (this does not include the weight of a collar or protective casting). Please note that when attaching the canister to a collar, a bracket must be placed on the canister. The orientation of the bracket is determined by the following options. Collar Configuration Options: GPS collars must be custom configured to the study species. The neck circumference adjustment range must be specified to +/- 2.0 inches to assure optimum positioning of the GPS antenna on the dorsal side of the neck. The collar width is also an option that is tailored to the study animal and must be specified by the researcher. Option 861: Expanded memory: 5300 Differentially Correctable Positions. VHF Location Beacon. Option 400 GPS Last Fix Status. Using this option, the VHF transmitter provides one of two pulse periods. The distinctive pulse periods report to the researcher on the success or failure of the last attempted GPS position. Option MDC Duty Cycles: Transmitters can be programmed to cycle through up to eight periods in order to extend battery life. Within each period, the transmitter can either be "on" or "off". Pulse rates can be uniquely defined for each "on" period. Each period can be defined from eight seconds to approximately 50 days in length. MS6 Mortality Sensor is also available. Operational life estimates provided above are based upon the assumption that the time required for the GPS unit to fix position is 90 seconds. Canister Weight: Approximately 620 grams (does not include the weight of a collar or protective casting). Please note that when attaching the canister to a collar, a bracket must be placed on the canister. The orientation of the bracket is determined by the following options. Option 002: The bracket is mounted to the 2.3 X 4.1 inch surface. Option 003: The bracket is attached to the 2.0 X 4.1 inch surface. Option 860--Standard memory: 2800 Differentially Correctable Positions. VHF Location Beacon. Option 400--GPS Last Fix Status. Using this option the VHF transmitter provides one of two pulse periods. The distinctive pulse periods report to the researcher on the success or failure of the last attempted GPS position. Option MDC Duty Cycles. Transmitters can be programmed to cycle through up to eight periods in order to extend battery life. Within each period, the transmitter can either be "on" or "off". Pulse rates can be uniquely defined for each "on" period. Each period can be defined from eight seconds to approximately 50 days in length. Canister Measurement: 3.50 X 4.375 X 5.0 inch (8.89 x 11.11 x 12.7 cm). Canister Weight: Weight 2.35 kg (includes electronics, batteries and internal cast). Total Configuration Weight: Weight 15 Kg (includes weight of canister, counter weight, collar and external cast). Collar Configuration: Collar is supplied in two sections. This is achieved by manufacturing a two-piece collar with the transmitter housing mounted on one piece (the top of the elephant's neck) and counter-weights mounted below the elephant's neck on the second (longer) piece CXM. 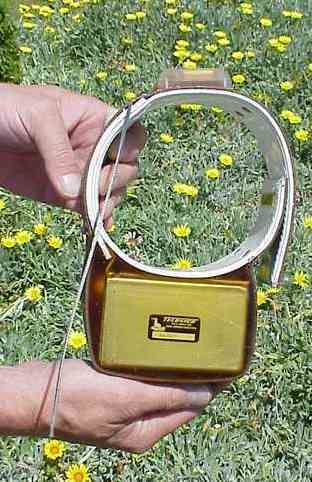 The collar is counter-weighted to maintain the position of the transmitter housing and GPS antenna at the top of the neck. The collar width is generally 7.62 centimeters and the adjustment range 2 to 4 meters. This is not a fixed adjustment range and can be changed per the customer's request. Protective Casting: For all GPS applications, the entire transmitter housing is cast in a high-density polymer (CAST-4) that acts as a shock absorber. Option 861--Expanded memory: 5300 Differentially Correctable Positions. VHF Location Beacon. Option MDC Duty Cycle, MS6 Mortality Sensor and Option 400 Last Fix Status are available. Transmitters can be programmed to cycle through up to eight periods in order to extend battery life. Within each period, the transmitter can either be "on" or "off". Pulse rates can be uniquely defined for each "on" period. Each period can be defined from eight seconds to approximately 50 days in length. Operational life estimates provided above are based upon several assumptions. Canister Measurement: 3.50 X 4.375 X 5.0 inches (8.89 X 11.11 X 12.7 cm). Collar Configuration: The collar is supplied in two sections. 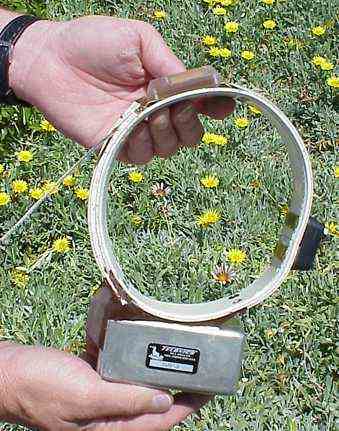 This is achieved by manufacturing a two-piece collar with the transmitter housing mounted on one piece (the top of the elephant's neck) and counter-weights mounted below the elephant's neck on the second (longer) piece CXM. The collar is counter-weighted to maintain the position of the transmitter housing and GPS antenna at the top of the neck. The collar width is generally 7.62 centimeters and the adjustment range 2 to 4 meters. This is not a fixed adjustment range and can be changed per the customer's request. Protective Casting: For all GPS applications, the entire transmitter housing is cast in a high-density polymer (CST-4) that acts as a shock absorber. VHF Location Beacon. Option 400 GPS Last Fix Status: Using this option, the VHF transmitter provides one of two pulse periods. The distinctive pulse periods report to the researcher on the success or failure of the last attempted GPS position. The operational life estimates provided above are based upon the assumption that the time required for the GPS unit to fix position is 90 seconds. Telonics warrants its products to be free from defects in material and workmanship for a period of one year from the date acquired. Telonics does not warrant batteries. Telonics integrates electronic subsystems procured on an OEM basis from reputable manufacturers. Consequently, Telonics cannot, and does not warranty the hardware, firmware, or software contained within these subsystems. The GPS receiver falls into this category.